Cate and Chloe who were kind enough to send me this box for review (as well as a discount code below! ), is a monthly subscription service that specializes in beautiful, timeless jewelry. Twice a month, Cate and Chloe sends you a piece from their collection (Yay! Two packages in one month, you know this Mommy LOVES getting mail!) the monthly cost is $39.99 and this price includes shipping! WooHoo! 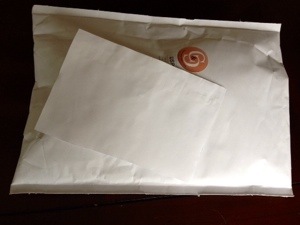 My package arrived in a nice padded mailer with the C&C logo clearly visible! First Peek! 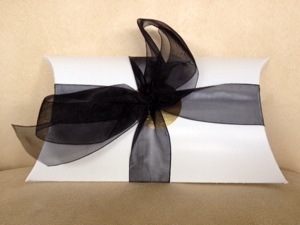 I was actually very impressed with this presentation and the beautiful ribbon, it definitely helps to make the package feel special! 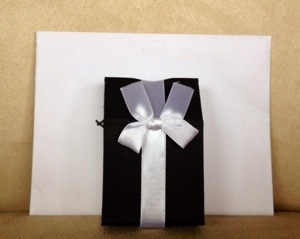 My piece arrived in a nice box with a very clever bow that acts as a magnetic closure! 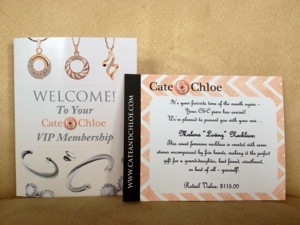 In my personalized envelope there was a welcome note that described the benefits of Cate & Chloe’s Monthly VIP Membership as well as a description card for the piece I was receiving. The Welcome Card that answers some frequently asked questions and lists the perks of membership! 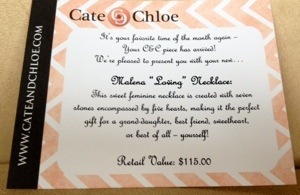 The Cate and Chloe description card with the name of the piece I received and a brief overview! I received the “Malena ‘Loving’ Necklace” described as “This sweet feminine necklace is created with seven stones encompassed by five hearts, making it the perfect gift for a grand-daughter, best friend, sweetheart or best of all – yourself!”The listed retail value is $115.00! Here is a closer picture showing more detail of the stones! Honestly, I was surprised at how beautiful this necklace is. It shines and sparkles so brilliantly, it is definitely gift worthy! And this is only one of TWO pieces you would receive in a month!?! This jewelry is much more my style than a lot of the ‘trendy’ subscriptions I have seen out there and is something I would be more likely to wear everyday, it goes with everything! I can’t wait to see what Cate & Chloe send me next!